St. George Church circa 1933. 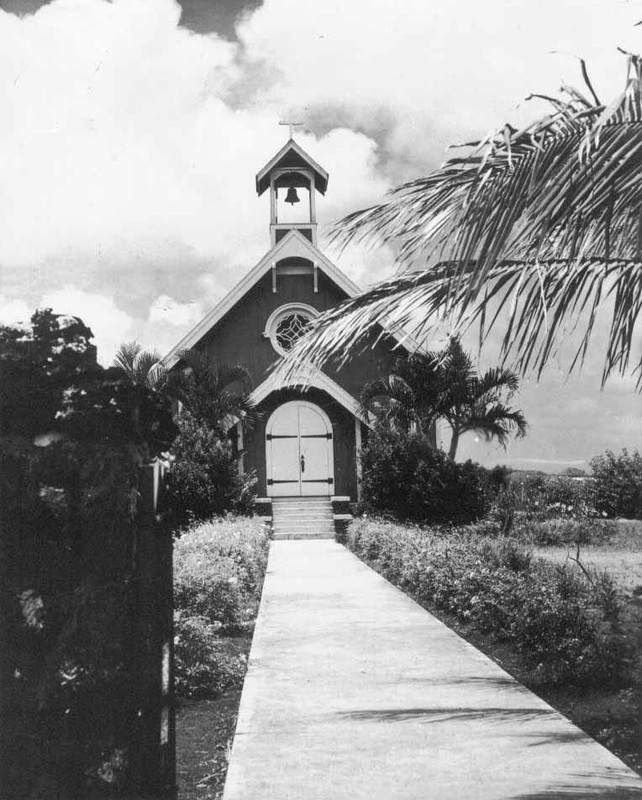 Waimanalo had its first Catholic chapel as far back as 1842, making it one of the oldest parishes on Oahu's windward side. A priest, journeying from the mother church of ﻿St. Ann﻿ in Heeia (Kaneohe), visited the community with some regularity, instructing, baptizing and administering the sacraments. The chapel was replaced in 1861 and was blessed by Bishop Louis Maigret on April 21 of that year. Five years later, Brother Victor Bertrand was sent to make urgent repairs and completed his work on December 1, 1866. From that time on, Fr. Martial Jan, SS.CC. (Congregation of the Sacred Hearts), in charge of the Koolau district, journeyed to Waimanalo every month to celebrate Mass. The local Hawaiians had formed a choir and sang so well that Fr. Martial gave them the joy of singing each time he celebrated Mass in Waimanalo. On December 12, 1870, a brand new bell, imported from France, was mounted in the tower of the chapel. In 1878, the Waimanalo Sugar Company was started with most of the labor imported from the Philippines and Portugal. With the arrival of these workers, the Catholic community grew. By the early 1930s, the chapel had become so weather-worn and termite-eaten that it had to be torn down. The Waimanalo Sugar Company offered a labor clubhouse where services could be held once a month. Fr. Patrick Logan, SS.CC., who had been assigned to Waimanalo, asked if the plantation would be willing to relinquish a piece of land, situated opposite the public school, that the plantation leased from the Territory of Hawaii. The soil there was poor for sugar cane cultivation, and plantation manager George Chalmers had no objections. The Territory was more than willing to exchange this property for a piece of Church-owned property in the Honolulu area. At the blessing of the new church in 1933, Fr. Logan explained to the congregation -- which included Chalmers -- that the new church would be dedicated to St. George in appreciation of the plantation manager's help. St. George was attached as a mission to St. Anthony of Padua Parish in the neighboring town of Kailua. In 1947, the Waimanalo Sugar Company closed its doors. Many of the laborers stayed on in Waimanalo as farmers and worked the land that was formerly sugar cane fields. Bishop James J. Sweeney proclaimed the community of St. George an official parish in 1954 and appointed Fr. Eugene Morin, SS.CC., pastor. Fr. Morin erected a small rectory and was succeeded by Fr. Louis Boeynaems, SS.CC., in 1956. Fr. Boeynaems began to make plans for a new church for the growing community. The present church building was completed in 1959. Utilizing some of Hawaii's natural resources, the front façade of the church was constructed of black lava rock; the sanctuary wall was constructed of white limestone. Bishop Sweeney blessed the new church on December 6, 1959 and the old church building became the parish hall. In 1966 Fr. Roland Peeters, SS.CC., succeeded Fr. Louis Boeynaems as pastor. Fr. Peeters served as the pastor until 1969 when Fr. Eugene Morin was once again assigned as St. George's pastor. Fr. Morin served at St. George's until he retired in 1974. In 1974, Fr. Mark Consalvi, SS.CC., was appointed pastor. He added a two-story rectory at the back of the church. The old rectory became office and classroom space. A new bell tower was constructed in 1981 and blessed on Easter Sunday of that year. The bell, which was found stored under the parish hall (the old church), is believed to be the same bell which was imported from France in 1870. In 1983, a small grotto and water fountain dedicated to the Blessed Virgin was constructed at the front of the church by members of the parish’s Filipino Catholic Club. The administration of the parish was turned over from the Sacred Hearts Fathers to the Diocese of Honolulu in 1985. Bishop Joseph A. Ferrario appointed Fr. Charles P. Kaleikoa as Administrator. A ramp was built for the handicapped and elderly along with a covered, concrete walkway with a hand railing for safe access to the rectory. Plans for a new, multi-purpose building were begun. In 1996, Bishop Francis X. DiLorenzo appointed Fr. Henry Sabog pastor of St. George. Continuing with the vision of a new parish hall, Fr. Henry had the old hall – which had become infested with termites – torn down. The office and classroom spaces in the old rectory were repaired, renovated and repainted. In November of 1997, Bishop DiLorenzo appointed Fr. William F. Mattimore as Administrator. Plans for the construction of the much-needed parish hall were put into full swing. The church pews, which had become infested with termites over the years, were repaired and refinished and a new Reconciliation Chapel (confessional) was built. A new rock wall enclosure was added to the front of the church and a sign (with night illumination) announcing Mass times, etc., was added to this area. In 1999, St. George parish “twinned” with Our Lady of Dolours (Sorrows) Church in Habarana, Sri Lanka, committing to raise $5,000.00 per year to help sustain this small parish in rural Sri Lanka. This goal has been met through special collections, bake sales, an annual huli-huli chicken sale, and other parish events. May 2001 saw the long-awaited start of construction on the new parish hall, and the church building was re-roofed. In December of 2001, the building was nearly complete, awaiting only the kitchen sink which arrived and was installed in August 2002. Moveable partitions for religious education classrooms were set up and the first catechism classes of the year were held in the new building on January 6, 2002. The new parish hall was blessed and dedicated by Bishop DiLorenzo on Saturday, February 2, 2002 and named “The Gathering Place." In January of 2006, a Memorial to the Unborn -- donated to St. George's Parish by the Knights of Columbus, Brother Joseph Dutton Council 7156 (Star of the Sea Parish, Kahala) -- was blessed and dedicated. The memorial and two sitting benches are located on the grassy area between the bell tower and the handicap access ramp. On January 15, 2007, Bishop Larry Silva appointed Father Alfred Rebuldela as Administrator Pro-Tem of St. George. In loving appreciation and honor of Father Bill Mattimore, the Gathering Place was rededicated and renamed "The Fr. Bill Gathering Place" on Sunday, August 26, 2007. Father Bill passed away one month later on September 29, 2007, in Massachusetts. Father Martial Jan,SS.CC. (Congregation of the Sacred Hearts), 1866-? Father Michael Scully, SJ (Jesuits), Administrator from July 2008 - May 2009. Father Robert "Bob" Maher, OFM Cap (Franciscan Capuchin), Administrator from June 2009-December 2011. Msgr. Romeo Nietes, Administrator Pro-Tem from December 2011-June 2012.